It’s Fall and my house is typically flooded with people, but this year’s vibrance of entertaining is starting a few beats later than usual. It was 100 degrees up till a few weeks ago in LA, so we’re just getting to Fall… even though butternut squash has joined kabocha and cubed pumpkin in the packed aisles of Trader Joe’s grocery store. I have a lot of catching up to do with the season. And it starts by having people over! Today, I’m celebrating my giant pumpkin of an enameled cast iron pot along with a fresh white Paddle Board with dip bowls – both gifted from Martha Stewart Collection – with some entertaining amazingness you can have on deck for last-minute dinners and last-minute guests literally any time they come by. First, this soup, fashioned by my sister Nicole, is everything you want in a soup: non-perishable ingredients you can keep on hand all season, a few simple steps and zero additives, chemicals, gluten or anything but goodness. 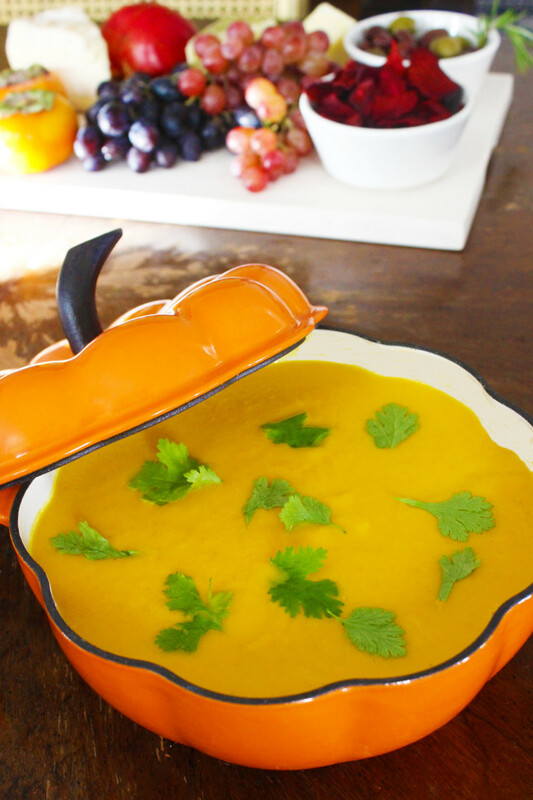 You can sub in cubed pumpkin if you’d like, but I love this sweet-savory squash soup. In large pot melt butter. You can substitute the butter for 2 tablespoons of olive oil. Add chopped onion and carrots; cook until onions begin to become translucent, about 7 minutes. Add garlic, cook for 3 min. Add carrots and the rest of ingredients. Bring to a simmer and cook until squash and carrots are tender, about to 20 minutes. Remove squash and carrots with slotted spoon and place in a blender and puree. Return blended squash to pot. Stir and season with nutmeg, salt, and pepper. Garnish with fresh Cilantro. And this, one, made with frozen butternut squash, can literally be on deck for any time people pop over. It’s wickedly impressive served in a giant pumpkin pot! 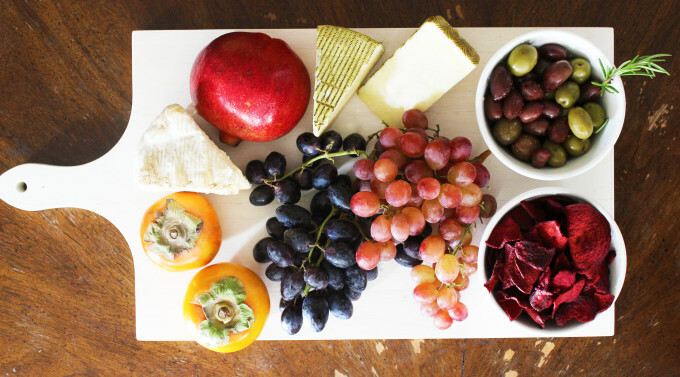 Now… for Fall Cheese Plate 101. Nuts are great as well, and they are long-lasting. I store mine in well-fastened Mason Jars to keep them fresh longer. I use all fresh fruits that are extremely Fall. Apples, Pears, Pomegranates, and for a bit longer in California, Grapes… Typically I’ll slide apples and toss them in lemon juice and a bit of honey to keep them from browning. You can also roast grapes and have them as a more savory addition to the platter. Because I’m 100000% gluten-free, I reach for root chips to brighten up platters. Pure carrot chips, or, in this case, organic beetroot chips, are spectacular. Olives work too, but I stick to spicy, more robust flavors since Fall and Winter are more resonant with root veggies and rich flavors. If you go for traditional cheese, go for creamy and lush. I like simple cheese like swiss and cheddar and feta in Spring and Summer with light veggies and light flavors. Fall requires, in my mind, lots of triple cream! Or anything luscious (even cashew cheese) that rounds out the plate with protien. And you can always put out some honey or preserves with a spoon, too. Gorgeous, taste-sensations, dynamic for conversation… soup and a “cheese plate”- even vegan- is a whole spectrum of a meal. It’s thrilling that each bite is something to compose and explore. Pair it with some memorable serving plates (and even if these weren’t gifted to me, I’d recommend them emphatically!) and you have Fall meals to remember, even last-minute ones that come together with creative and heartfelt synergy! Have loads of people over this Fall and Winter. It’s the abundance-generator and the love-making move of the seasons ahead!! 10 Simple Ways To Make Your Days Far More Productive & Powerful! Are You Waiting For The Perfect Time To Make A Change At Home… Or Anywhere? Grey Walls Can Calm & Focus Your Space…And Your Life! Previous post: Feng Shui To Raise The Level Of Love All Around You!